What depicts autumn better than colored leaves and pumpkins? 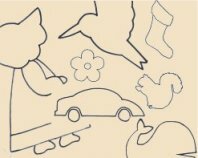 You're sure to come up with loads of projects to use these colorful and lively autumn appliqu?s. 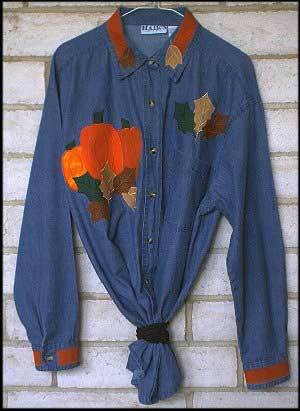 Add a spray of autumn-hued leaves to a shirt pocket or collar. 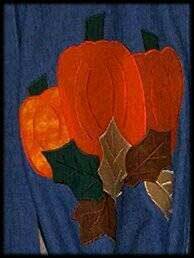 Create a vignette of pumpkins and leaves to adorn the back or top of a blouse for a charming and festive holiday outfit. Use Wonder Under to adhere the appliqu?s to the shirt and zigzag around the pieces to prevent fraying. Iron Wonder Under on the wrong side of the material. of a long sleeve shirt. shirt as directed for the Wonder Under. Enjoy your NEW fall shirt!